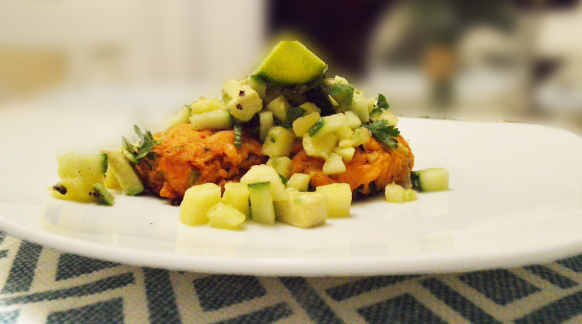 in a bowl, combine your sweet potato mash, and flaked salmon. In a pan, fry the garlic and onion in the coconut oil for 10 minutes. Add to the bowl and mix throughly. Add a pinch of paprika. Now add the handful of coriander, mix throughly. Season with salt and black pepper. On a baking tray, grease and line with baking paper. Heat your oven to 250/375 degrees. Separate the fishcake mixture to form patties. Bake in the oven for 30-40 minutes, turning regularly until a crisp forms. Meanwhile, make the salsa, by taking the chopped avocado, pineapple, cucumber and coriander and lime juice and mixing in a bowl. Season. Serve on top of the fishcakes.